FCA's Windsor assembly plant runs three shifts per day, building about 1,500 Dodge Grand Caravan and Chrysler Pacifica minivans. Fiat Chrysler will idle its minivan assembly plant in Windsor, Ont., beginning Monday, union officials there said, because of a parts shortage. 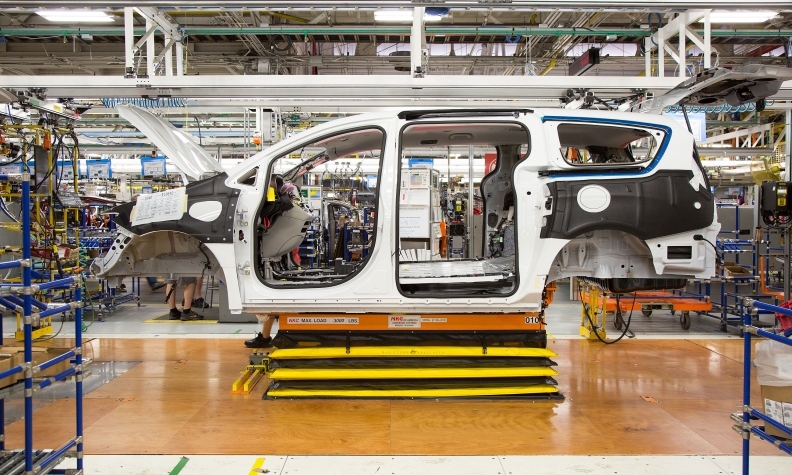 FCA’s Windsor assembly plant runs three shifts per day, building about 1,500 Dodge Grand Caravan and Chrysler Pacifica minivans. About 6,000 employees at Windsor Assembly are affected. An FCA spokeswoman did not respond to requests for comment Thursday night on the report, and union officials could not identify the component or supplier causing the shortage. It was unclear whether the issue was because of a large fire earlier this week that destroyed a Magneti Marelli warehouse in Tennessee. Magneti Marelli is a subsidiary of Fiat Chrysler Automobiles which is a major lighting component supplier to FCA and other automakers. "FCA told us that they are going to give us a formal letter indicating that we are down but I haven’t seen it, yet," Unifor Local 444 president Dino Chiodo told Automotive News Canada, just minutes after speaking with company management late Thursday. "There is a posting in the plant already that suggests that, potentially, all next week we’ll be down. "They’re trying to get everything in place and trying to determine if this is going to be the whole week or just a couple of days." Workers are scheduled to have Friday, Nov. 11, off anyway to observe Remembrance Day in Canada. Chiodo said FCA told the union the shutdown is due to a parts supply issue. "Windsor Assembly Plant basically will not be operating next week because of some supplier issues that have occurred over the last few days," Chiodo said. "Because of that, they will be forced to shut down their operations to try and figure out how to get everything back into place and back into operation again." Magneti-Marelli’s plant and warehouse in Pulaski, Tenn., supplies lighting for the minivan from a plant and warehouse in Pulaski, Tenn. A large blaze Tuesday destroyed Magneti Marelli’s main warehouse in Pulaski, Tenn., used to store auto parts and shopping boxes, according to local media. The building is considered a total loss after the roof collapsed. FCA's minivan plant was already at risk of being idled if Unifor and Integram (Magna) Seating couldn't come to an agreement on a new labor agreement late Thursday. The strike was averted early today when a tentative labor agreement was announced by Unifor. The union was set to strike at the company that makes seats and "foam buns" for the minivans. Staff reporter Larry P. Vellequette contributed to this report.